Director – John Gilling, Screenplay – Peter Bryan, Producer – Anthony Nelson Keys, Photography – Arthur Grant, Music – James Bernard, Music Supervisor – Philip Martell, Special Effects – Bowie Films Ltd, Makeup – Roy Ashton, Production Design – Bernard Robinson. Production Company – Hammer/Seven Arts. Professor of medicine Sir James Forbes receives a letter from his former pupil Peter Tompson, now a GP in a small town in Cornwall. Tompson mentions how he is baffled by a strange plague that is killing the locals. Sir James and his daughter Sylvia travel to Cornwall to investigate. Not long after they arrive, Tompson’s wife Alice succumbs to the plague and dies. The local squire Clive Hamilton forbids them to conduct autopsies on the bodies so Sir James decides to conduct an illegal exhumation, only to find that all the coffins in the graves of the plague victims are empty. Sir James realises that Hamilton is using voodoo to raise the dead as zombies and is then employing them as slave labour in his tin mines. As he makes this discovery, Hamilton conducts a voodoo spell to bring Sylvia under his control. 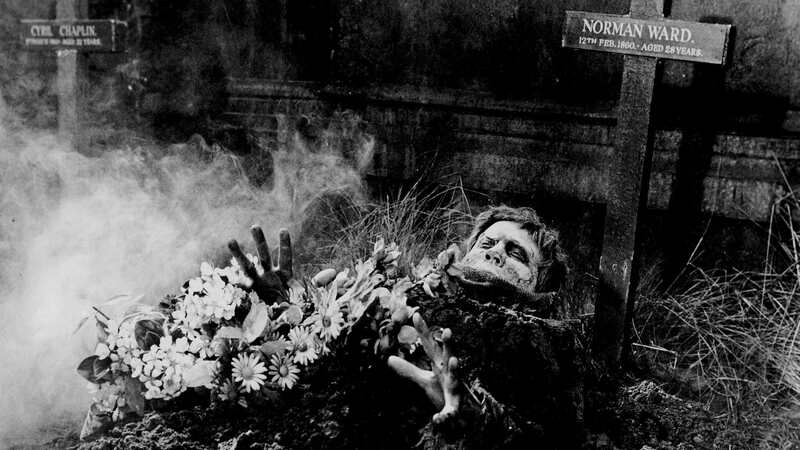 The Plague of the Zombies is a Hammer film that has gained a modest cult reputation in Anglo-horror circles. This is something that was boosted by its relative obscurity on video/dvd up until recent years. It was directed by John Gilling who had made a number of other Anglo-horror films. (See below for a listing of John Gilling’s other films). The Plague of the Zombies is frequently discussed in tandem with Gilling’s The Reptile (1966), both of which were shot back-to-back. Both films use many of the same sets – the village streets and the inn – and have similar plots with outsiders arriving in a small village in Cornwall where they discover that something is killing off the locals. In both cases, the menace is seen to be foreign in nature (voodoo here, a woman transformed into a snake creature after being abducted by a snake cult in Borneo in The Reptile). Both films also star Jacqueline Pearce as one of the central characters who is transformed by the menace, as well as contain a minor appearance from Michael Ripper as one of the locals. John Gilling directs with florid effect. There is a striking opening sequence involving rituals being conducted by figures in white hoods smeared with bloody symbols. The film gains some impact in the long scene where Andre Morell and Brook Williams dig up Jacqueline Pearce’s grave and we wait in closeup on her face before her eyes suddenly open and she then crawls out of the grave with a lascivious smile, before being decapitated by Morell. This is followed by the much remembered (and copied) scene where Brook Williams has a dream of the zombies clawing their way up out of the grave and coming after him. There are many other notable pieces – the eerieness of the scene where John Carson draws Diane Clare to him, as well as a reasonably intense climax as the house and mine go up in flames. Regular Hammer makeup man Roy Ashton creates some excellent zombie makeups – with their pallid faces and glowing eyes, these look startlingly gruesome, even after two decades of exposure to George Romero copies. 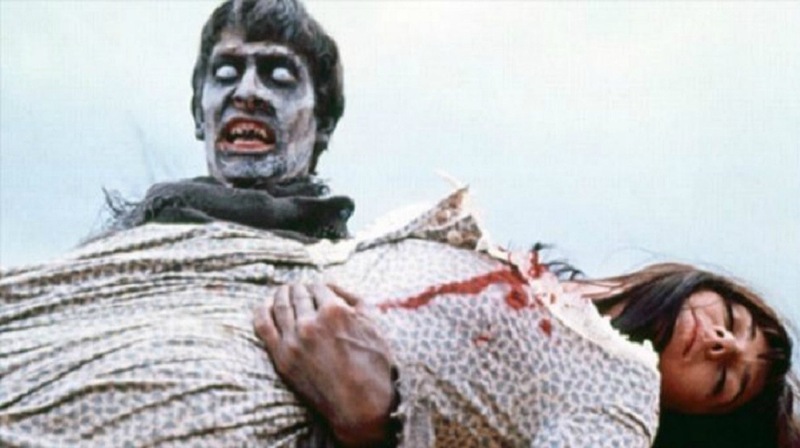 The Plague of the Zombies also has a striking political subtext – that of an uncaring aristocracy and their exploitation of the working classes. Gilling sets up a series of potent images that illustrate this – the fox hunt with the hunters riding through the village at full tilt, heedlessly charging through a funeral procession, knocking the coffin over the side of a bridge; or where Diane Clare is abducted by the local Hellfire Club who circle and taunt her and then gamble over her fate. (Gilling loves the image of the aristocrats resplendent in their spiffing scarlet red jackets). The idea of the peasantry being turned into zombies to work in the mines is rich in symbolism and the images that we see of the zombies being whipped and made to work are striking. On the minus side, some of the plotting is vague – it is not made clear why John Carson is also zombiefying and placing the women of the show under his spell – it is a little far-fetched to believe that he is doing this because he wants to turn them into slaves in the mines as well. Rather his motives seem to be the all-embracing Hammer standby of the courtly nobleman placing women under his hypnotic spell with sinister intent. Andre Morell fulfils the role of the savant that in any other Hammer film would mandatorily be played by Peter Cushing. Morell plays the part with an aristocratic grace – it is almost as though a Peter Cushing role had been cast with a country gentleman. John Carson is in what normally be the Christopher Lee role – that of the sinister lord of the manor up to no good. However, John Carson eschews any sense of the sinister threat that Christopher Lee would have given the role and plays the part with a mannered politeness that contrarily serves to only give the character even more sinister effect. John Gilling’s other genre films include:- Mother Riley Meets the Vampire/My Son, The Vampire/Vampire Over London (1952), The Gamma People (1956), The Flesh and the Fiends/Mania (1960), The Shadow of the Cat (1961), Panic (1963), The Night Caller (1965), The Reptile (1966), The Mummy’s Shroud (1967) and The Devil’s Cross (1975). Gilling also wrote the scripts for House of Darkness (1947), The Gorgon (1964) and Trog (1970).